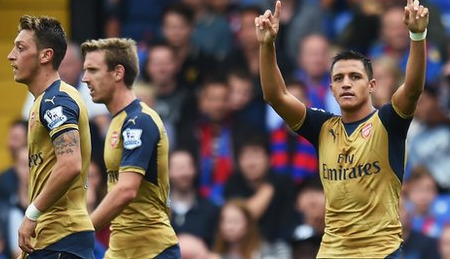 Arsenal gain their first points of the new season as they beat Crystal Palace. Arsenal beaten by West Ham on the opening day – secured all three points just before the hour as Delaney handed the visitors their sixth successive win over Palace. Giroud opened the scoring with an acrobatic finish before Ward pegged the Gunners back with another impressive strike. The visitors pushed on after the interval and secured the three points after Delaney put through his own goal. Crystal Palace manager Alan Pardew, speaking to BBC Sport: "The game changed on two incidents. We hit the post at 1-1 and you have to argue they are lucky to have 11 players. Everyone knew in the stadium Francis Coquelin should have gone. "The game was very even, they play a different style. They were good, much better than against West Ham. Sharper in the mind and we still feel aggrieved we haven't come out with anything. "Arsenal were a hurt animal but the early period was bad for us, we made a lot of mistakes." Arsenal manager Arsene Wenger, speaking to BBC Sport: "Our fluency was good in the first half and our mental response was good at 1-1. "It was a bit scary to look at the chances we missed - you thought we would be punished after that but we dug in and hung on in the last 10 minutes, and that too is important in the season. "Alexis Sanchez has only had two weeks of training but still he had the mental resources to score us a vital goal today. We know it's not a 100%-fit Sanchez but a 100%-motivated Sanchez, and that at times can be enough."